I’ve talked and blogged about Japanese food before, as have our friends over at TJX. In fact I’ve even made a video or three on the subject. (In all fairness, the TJX crew did this as well.) But there’s something missing from our videos, something that would give them that extra “bam!” — a cute toy poodle, perhaps? Meet Francis, the aforementioned toy poodle. 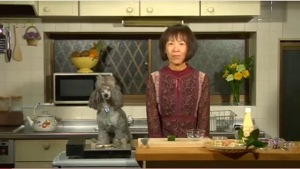 In his series of videos, he (with the help of his unnamed human sous chef) shows you how to make a wide variety of traditional Japanese dishes — the traditional fruity sponge cake served during the holidays in Japan, to fried shrimp, nikuman (those steamed pork buns that the TJX crew have gone on about), mapo tofu (favorite dish of Tenshi! ), and many more. You’ll definitely want to have a large supply of snacks handy while you watch these. In the video (below the cut), Francis shows you how to make the classic Japanese bento (complete with those cute octopus sausages that you see all the time in anime). Be sure and check out their YouTube channel to learn how to make even more traditional Japanese dishes. Poodles are nice goggies. Real bright. Srsly. Mark Segal had a couple in the time I’ve known him. Weird attempt at a French accent on Francis, though. New seiyuu needed, stat. Glad it wasn’t what I had feared when first I saw the title. C’est si bon! The accent didn’t strike me as French, just standard Japanese-not-used-to-speaking-English. Besides I kinda liked it.